August marked an unprecedented surge in the arrest, detainment and mistreatment of human rights and women’s rights advocates, human rights lawyers, and religious minority followers. The intensifying crackdown has been considered as a crisis point in the situation of human rights in Iran and an attempt on the part of the ruling regime to silence any voice of dissent. Rassoul Sanaii Rad, political deputy for the IRGC, admitted earlier this month that 28 per cent of those arrested in the anti-regime protests were young women and girls. Human Rights Watch issued a news release on August 31, 2018, calling for the freedom of jailed protesters including 15 women in Iran prisons. The news release reads in part: “Iranian authorities should drop all charges brought against protesters for peaceful assembly and release those detained on that basis, Human Rights Watch said today. Since August 2, 2018, authorities have detained more than 50 people during protests in Tehran. On August 11, 2018, an Iranian journalist, tweeted that authorities had detained 15 women they had arrested during the August protests in Qarchak prison in Tehran, HRW said. Fatemeh Dizaji, Elaheh Bahmani, Khadijeh Kiani-zadeh, Hadiseh Sabouri, Sara Malek-Shirazi and Mojhdeh Rajabi are among those detained in Qarchak Prison according to this journalist. 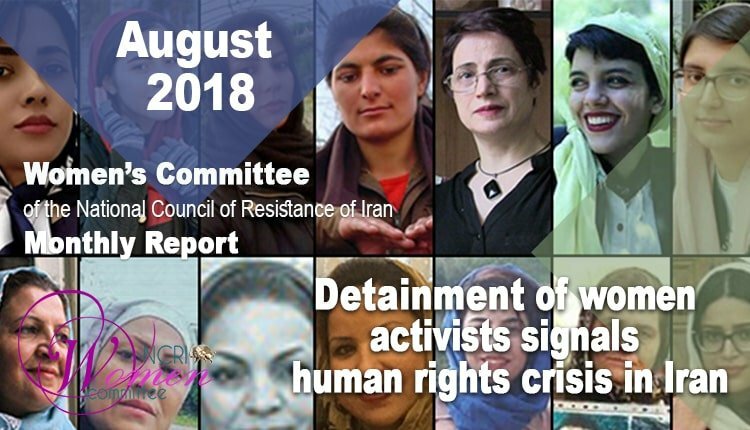 The NCRI Women’s Committee has not independently confirmed the names but these figures should be considered the least and the actual figures of arrest and detention of women during the August protests is higher. The Women’s Committee of the National Council of Resistance of Iran calls on the International Community, the UN agencies, and particularly the UN High Commissioner for Human Rights, to take immediate measures to secure the unconditional release of political prisoners and prisoners of conscience, especially women, and stop their mistreatment in prisons.